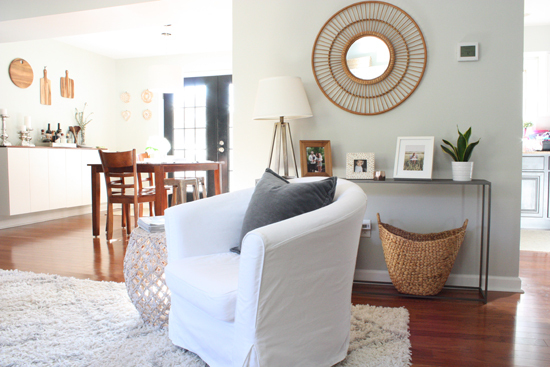 To try and ease myself back into blogging I'm continuing the room tours showing how our house has evolved since moving in two and a half years ago. We have done a lot of work so far, with a decent amount still planned. Since moving in we have successfully repainted every room in the house with the exception of the fourth bedroom. That final room is our winter project, and it's going to be a good one! 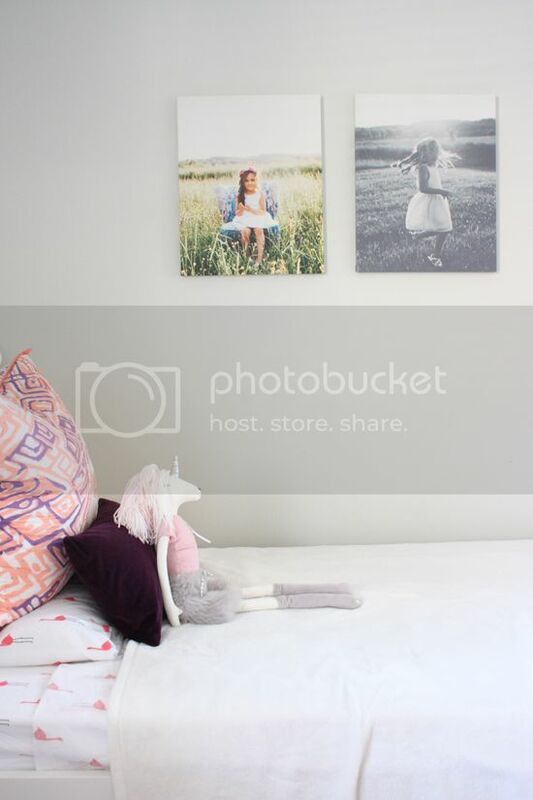 Today I'm sharing how Lucy's room now looks since I last took some photos. 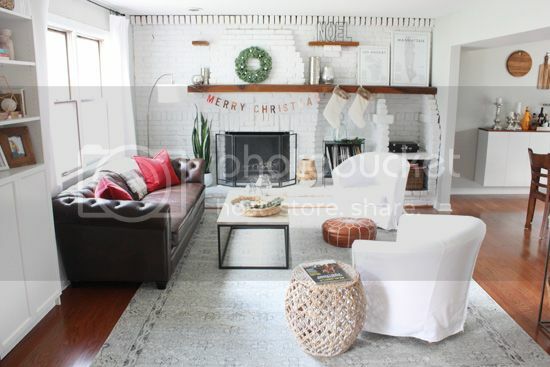 It definitely has changed a bit with some furniture swaps and fresh wall art. 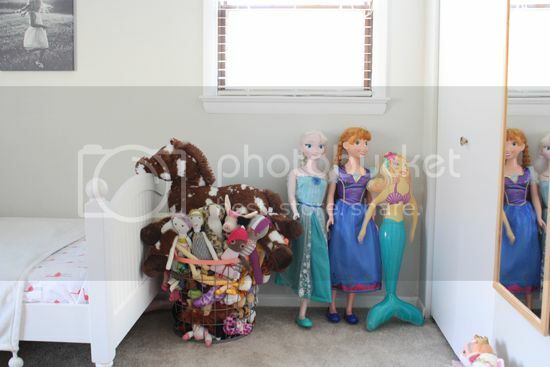 For a more dramatic comparison, her room looked like this before we moved in. 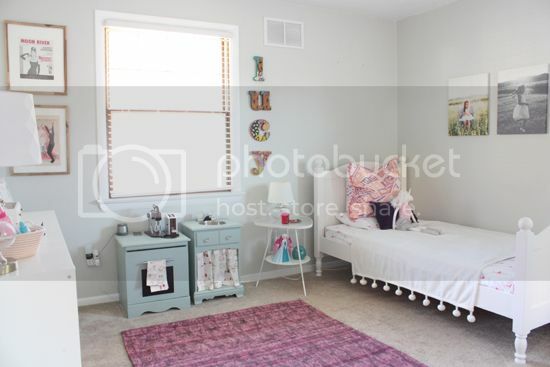 Fresh paint and a new layout has helped this room come a long way. 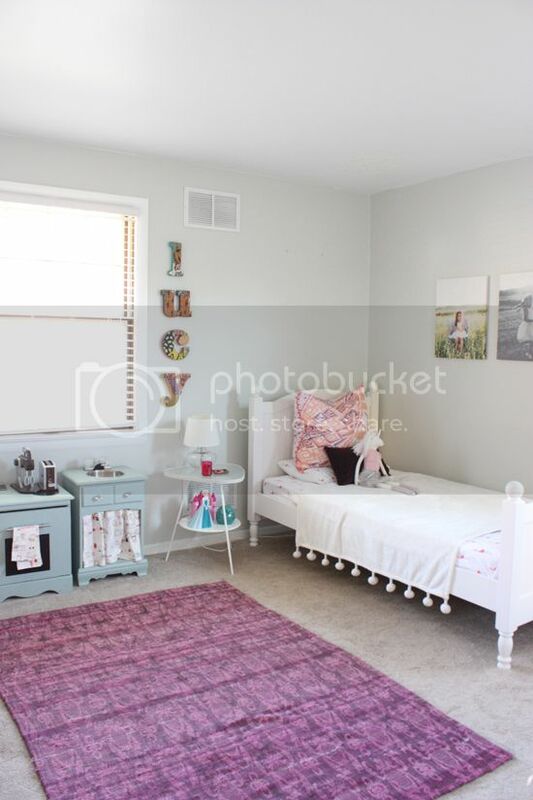 The way the bed was positioned from the corner made the room look so much smaller. We chose to have the furniture against the walls for two reasons. First, we wanted to have one side of the bed against the wall until Lucy was older and less likely to roll out of bed. 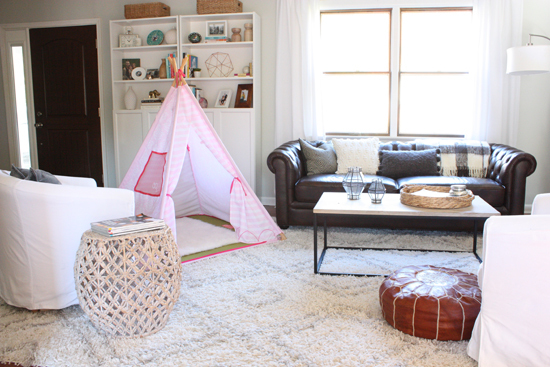 Also, the girls love to camp out on the floor and play with their toys on the rug so we wanted to maximize play space. As she gets older we will probably move the bed to come out of the wall, but this is the best setup for now. First thing you may notice is that we took out her dresser. We had a small Ikea Malm dresser for some time, but as Mila grew and began to open drawers we knew it was unsafe and more prone to tipping over. Plus with two closets we really didn't need the additional clothes storage. I was using one of the closets as toy storage, but Lucy never went in there for toys so it seemed a bit of a waste. 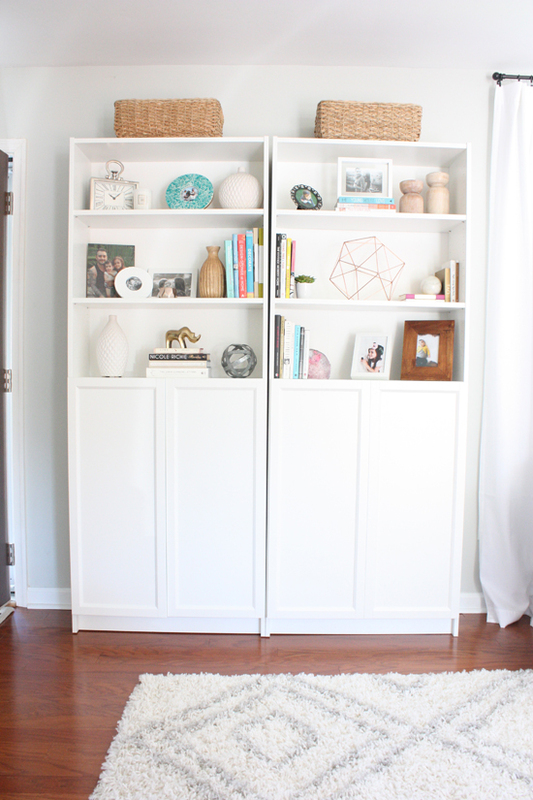 We returned the Malm to Ikea (they will refund you if you have one! 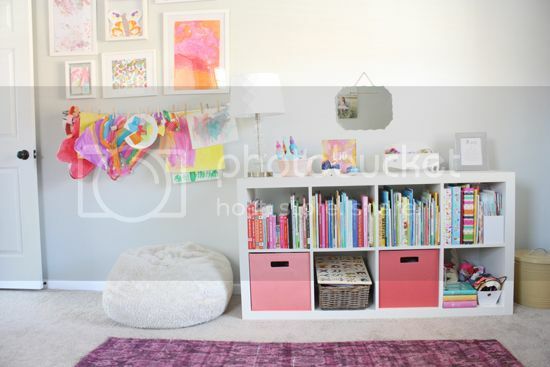 ), used the second closet for her clothes and flipped her bookshelf down. 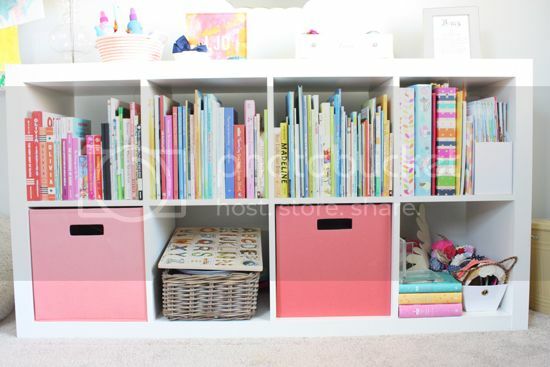 This gave us better accessible storage for books and toys. Our girl loves reading and books have quickly been taking up more and more space in the bookshelves. We also have her High Five mags, storage cubes with puzzles and small toys, as well as binders filled with school projects from preschool. She pulls those binders out once a week and loves to flip through and remember the different things she did the past few years at her old school. Flipping the bookshelf down also provided a place to put hair bows, her jewelry box, brushes and other things at her reach. Keeping things where she can access has helped groom her independence when it comes to getting ready each day and at bedtime. 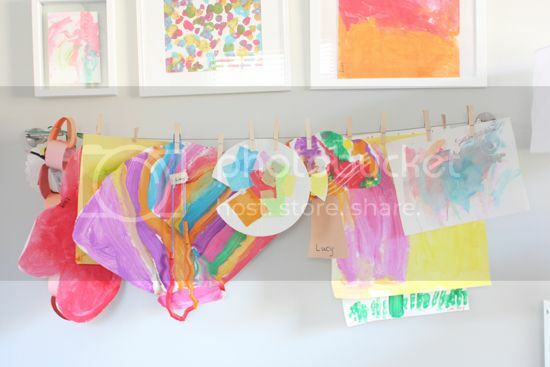 My favorite part of her room is still her art wall. Between school and home we have new masterpieces almost daily. I try to switch out the hanging pieces as often as I remember. I love the bright colors in that little nook. Stuffed animals are one thing we can't seem to escape. Every few weeks I sneak some older, unused ones out of the house and donate them. 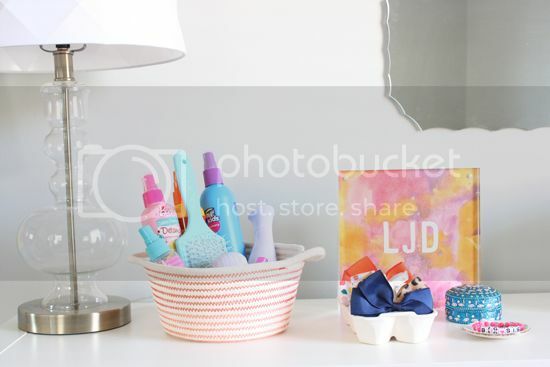 The favorites that still get a lot of love and play time are kept in a metal basket at the foot of Lucy's bed. We also have some large ones that are kept in her closet. Lucy's bedding is pretty simple, just sheets and a fleece blanket. We've tried comforters, but she gets too hot when sleeping and ends up kicking them off, so they're pretty pointless. 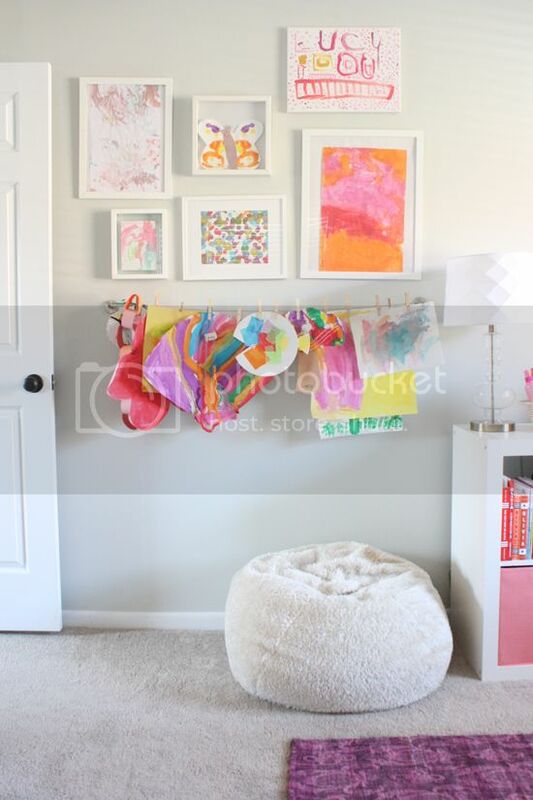 The canvas prints above her bed were made from family photos we took last Spring. Those photos are such perfect representations of our girl. I'll be honest, I can't remember which company I used, but I do know I waited until they had a super discounted canvas sale. 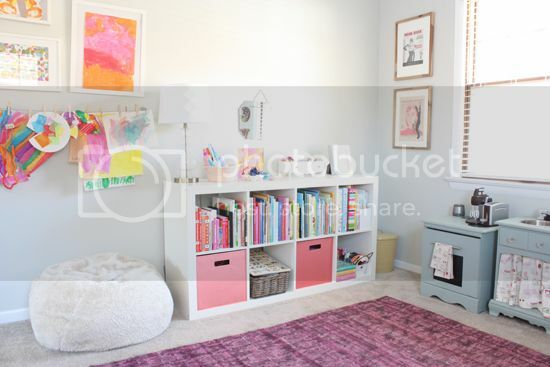 For me, the most important thing when it came to designing Lucy's room was to make a place where she was comfortable and wanted to spend time. I love that on weekend mornings she will quietly play in her room before the rest of us wake up. Guys... I bought another rug. 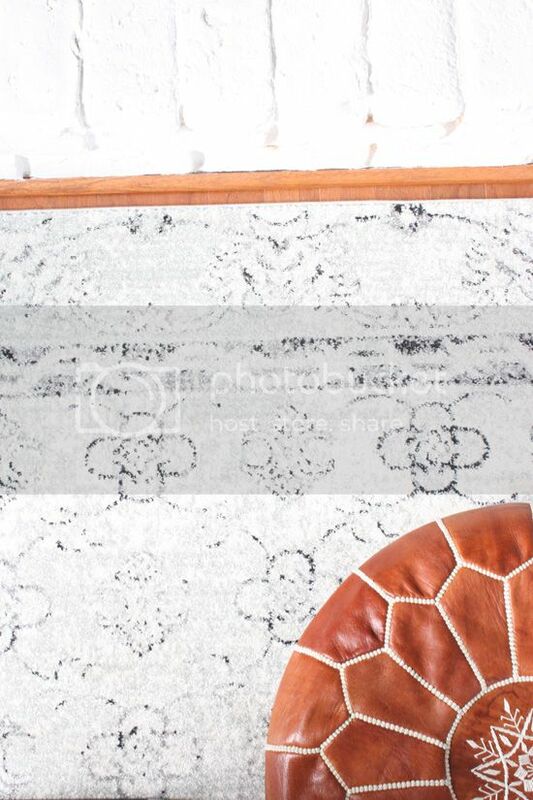 You may or may not know, but I have a problem with buying rugs. I'm addicted to RugsUSA and can't help but peek at their website every time they are having one of their mega sales around any and all holidays. Of course we didn't NEED a new rug. 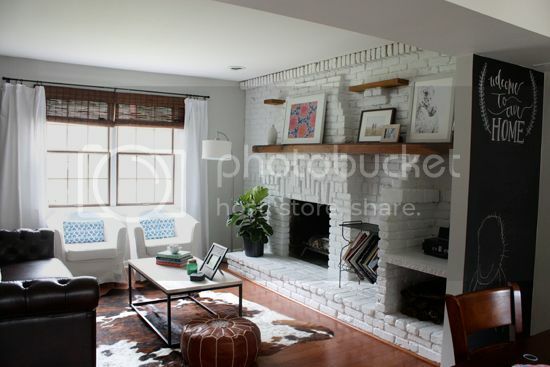 But this 9x12 beauty for just $116 and FREE shipping that arrived at our door in less than a week? SOLD. So why did I buy a new rug? Let's rewind a bit. This is the 5th rug we've had in this room in almost four years. I know, I know, but bear with me. 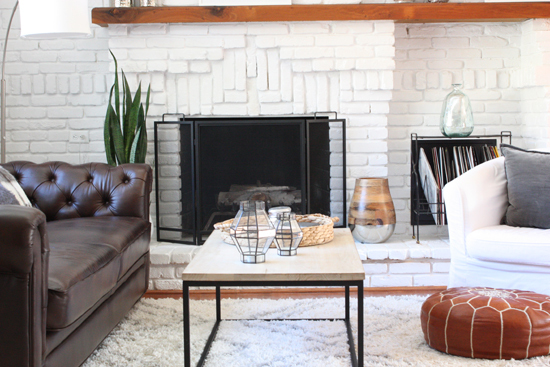 When we first moved in I put our cow hide rug (Rug #1) in front of the fire place with an old Target rug (Rug #2) behind the couch. 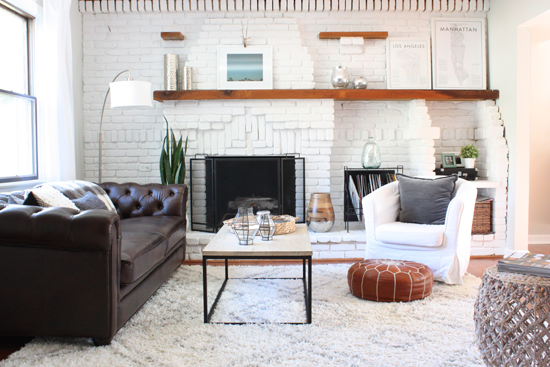 The cow hide was a great rug and I love what it did to the space visually. But after time I realized it's definitely all look and no comfort. Plus occasionally it smelled weird, I guess that comes with cow hide. 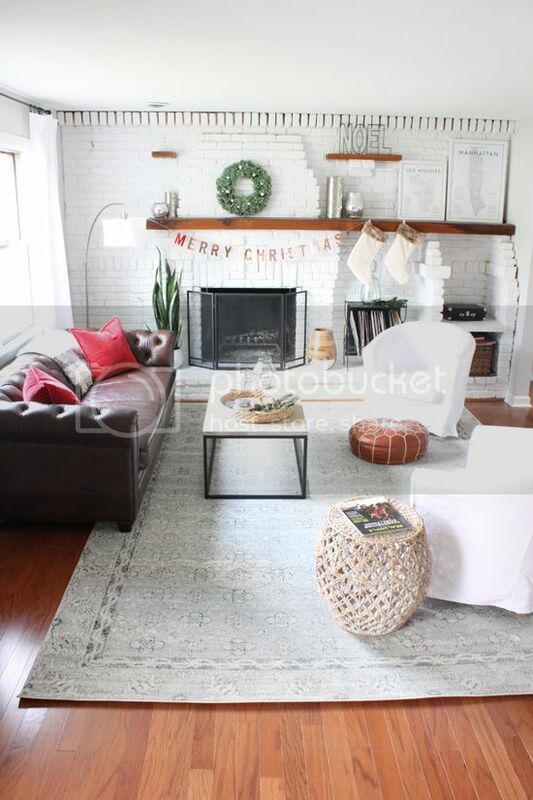 For a living room I wanted something cozy and comfortable. 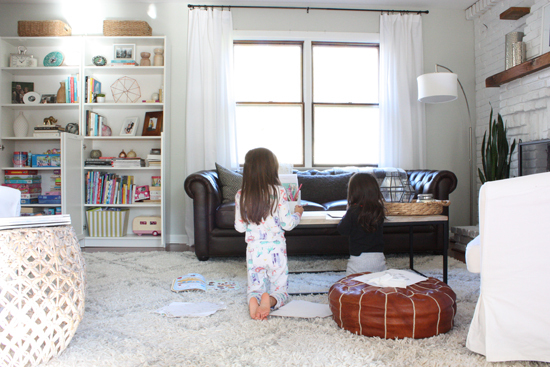 The rug behind the couch created a great space for the girls to play, but it was old, stained, and not very soft. Besides it was only meant to be a temporary solution. Enter Rug #3. My first RugsUSA purchase which began the obsession. It was soft, comfortable and pretty. 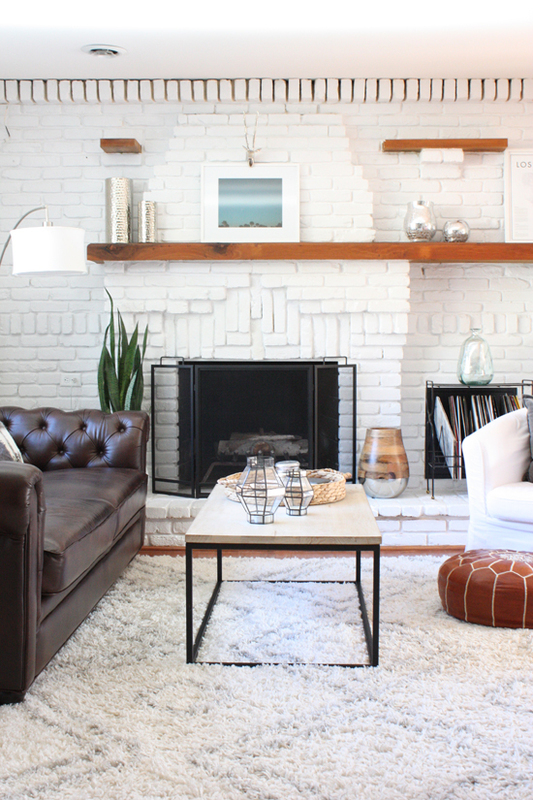 I was in love with the Moroccan design and was channeling the living room of my favorite, House*Tweaking. 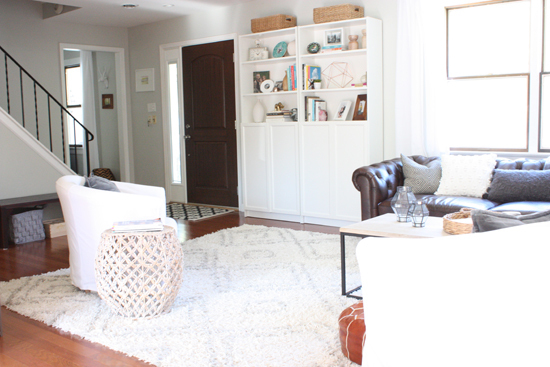 This rug was a pretty good deal for just $163. You can read more about purchasing that rug here and here. This has been an awesome rug. Easy to vacuum and it's light and bright. Exactly what I wanted for this space. Although I don't remember the exact price I know I paid just under $200 for a 9x12. It wasn't super thick, but I was ok with that. 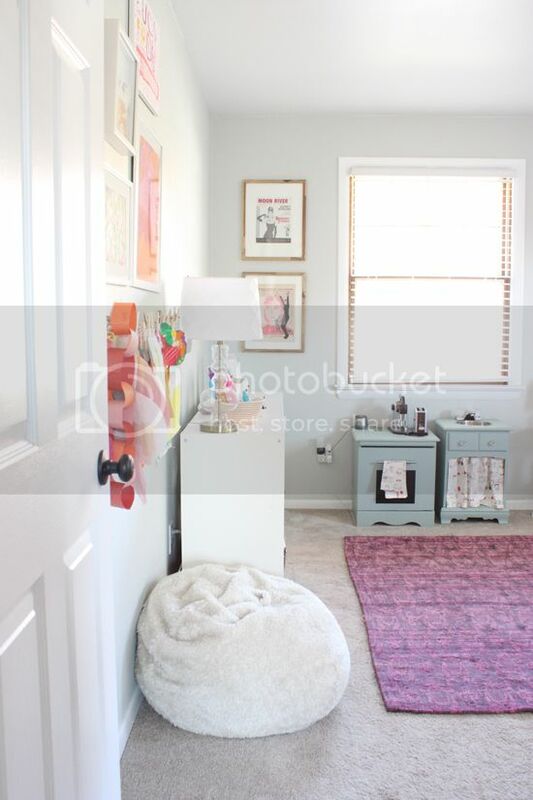 I figured the shag was soft enough for the kids to play and the color was what I wanted to brighten up the space. This room gets a ton of use. The girls play all over it and the floor is usually covered in Barbies, puzzles, crayons and much more. Lately the shag has begun to overstay it's welcome. 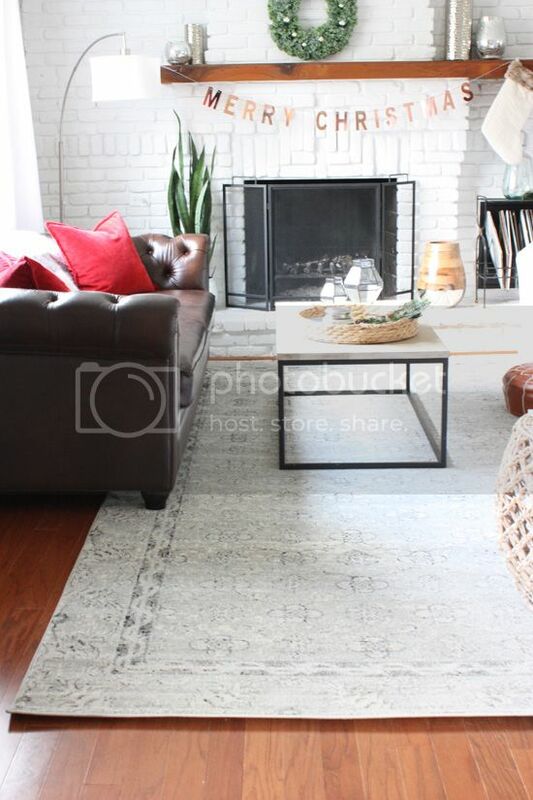 It's been a year and a half, but I've noticed that the exposed rug has started to become gray and dingy while the parts where the furniture cover are still bright and white. I'm nervous to try and shampoo it after reading Dana's disaster which ultimately led her her just buying another rug anyway. My biggest peeve is that I'm tired of vacuuming up legos and stepping on buried Barbie shoes and finding hidden cheerios or other food among the shag. Like I mentioned, I always peek at RugsUSA during their sales just to keep some things in mind. 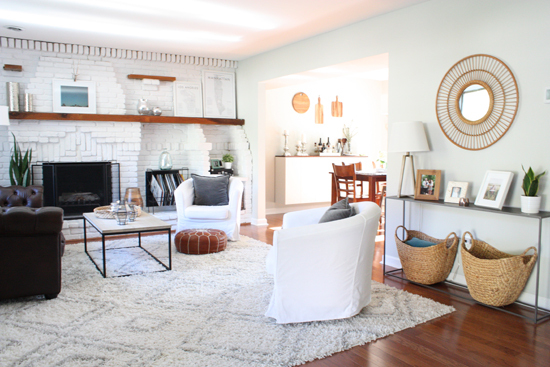 On Black Friday I was pleasantly surprised when I found a 9x12 gray and white rug listed for just $116!! I seriously couldn't believe it. It must have been a rare deal because it's no longer even listed on their website for me to share with you. At that price with free shipping, I couldn't pass it up. The new rug arrived in less than a week and I love it! 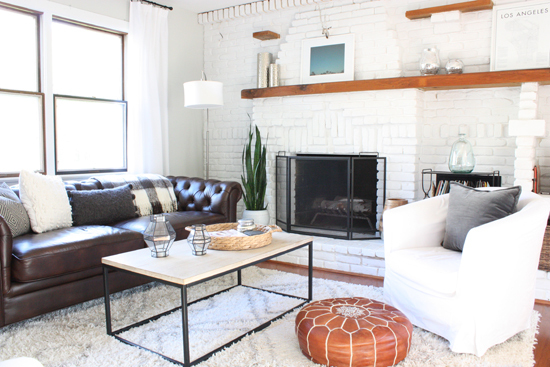 The gray/black tones in the rug really warm up the space. Our red Pottery Barn velvet pillow covers will go back to the regular Ebony color after the holidays and I think they will look even better. The rug is still very soft to lie and play on, my kids haven't noticed a difference. :) Tiny toys are easy to spot and have saved my bare feet. 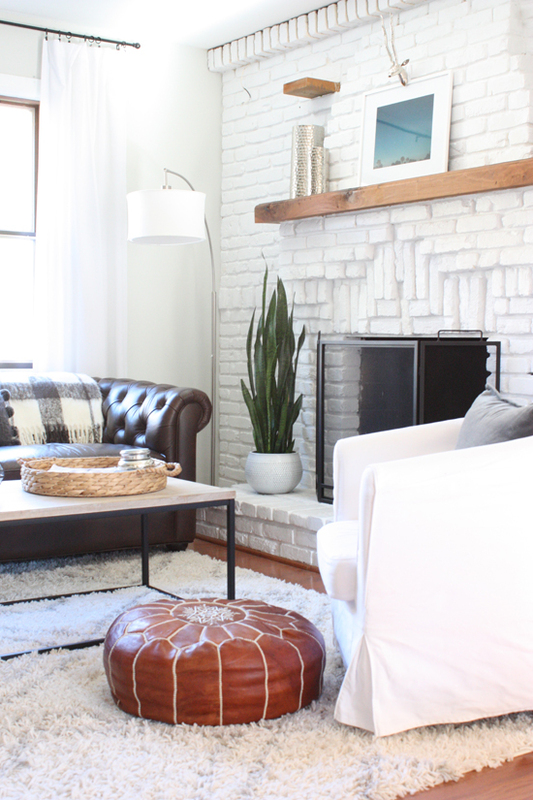 For a full tour of our living room including a resources list, check out this post. And finally, because I love doing this sort of thing, let's check out how the living room looked before we moved in..
and how things look today. 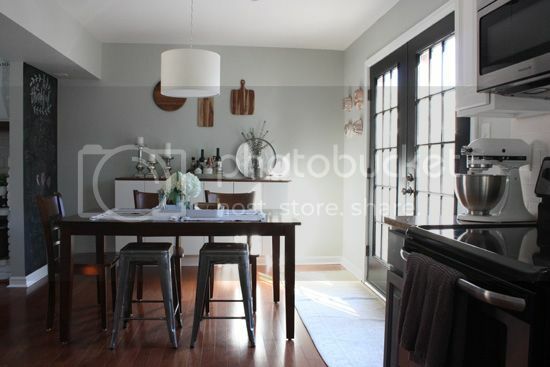 The french doors in our kitchen were definitely one of the selling points for us when buying our house. 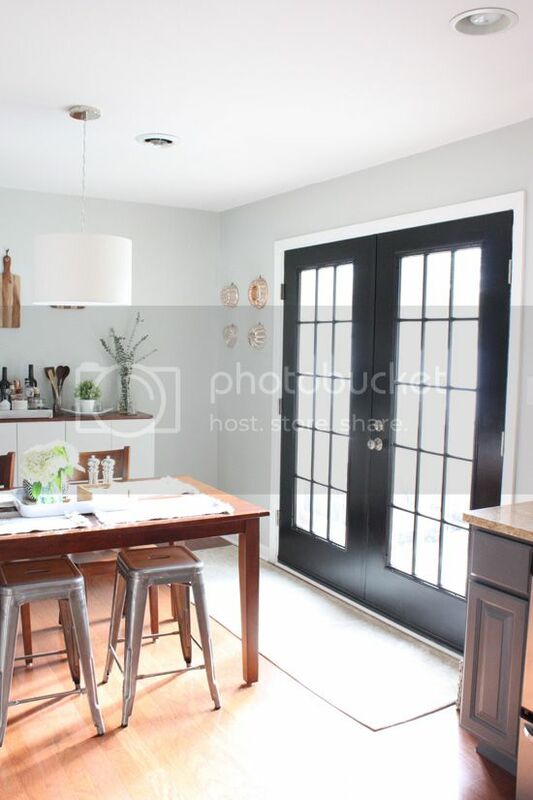 I love natural sunlight and the thought of pulling both of those doors wide open on a warm day and letting the sun stream into our kitchen with a view of our backyard was just so dreamy to me. We certainly get a ton of sunlight, especially in the morning. After two years of draping towels over the doors during breakfast to block the sun I finally invested in some window treatments. 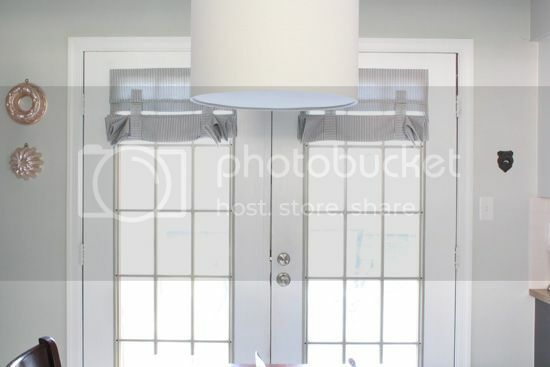 I searched for some time before deciding on these curtains from DaniDesignsCo on Etsy. I wanted something that wouldn't permanently block the light, that I could fully open during the days, but would provide privacy at night as well as when the sun was just a little too bright to sit at the table. 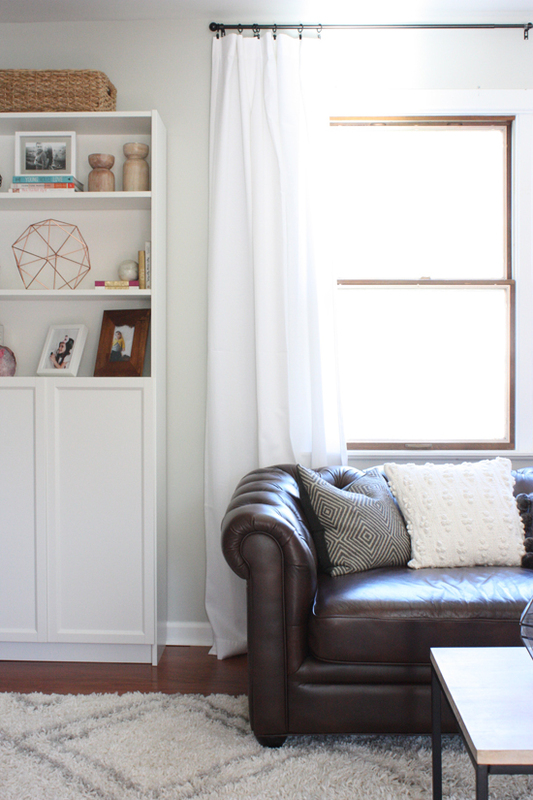 These curtains are so easy to install (velcro! ), within 20 minutes of opening the package they were on the doors. 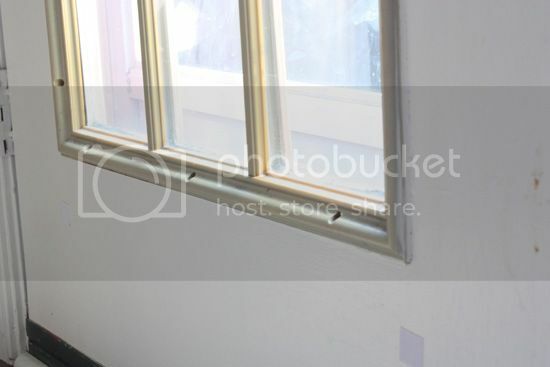 You can see from photos in her shop that the curtains fully extend down to cover the entire window, while keeping the doors themselves uncovered. I had been talking about repainting the doors since we moved in. The white side didn't look bad, but could use a fresh coat. What bothered me most on that side was the yellowed plastic dividers. At first I wanted to remove them completely (think Dana's kitchen doors). 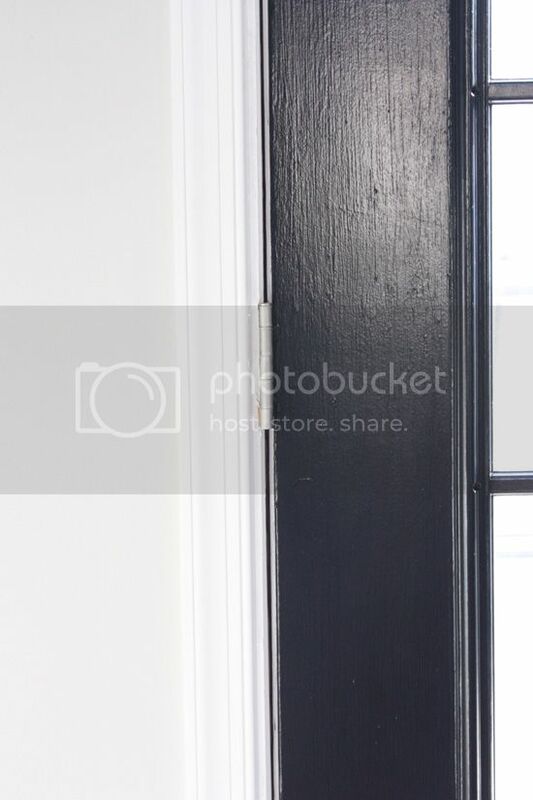 We would need to do some repair work and figure out a replacement trim for the edges. 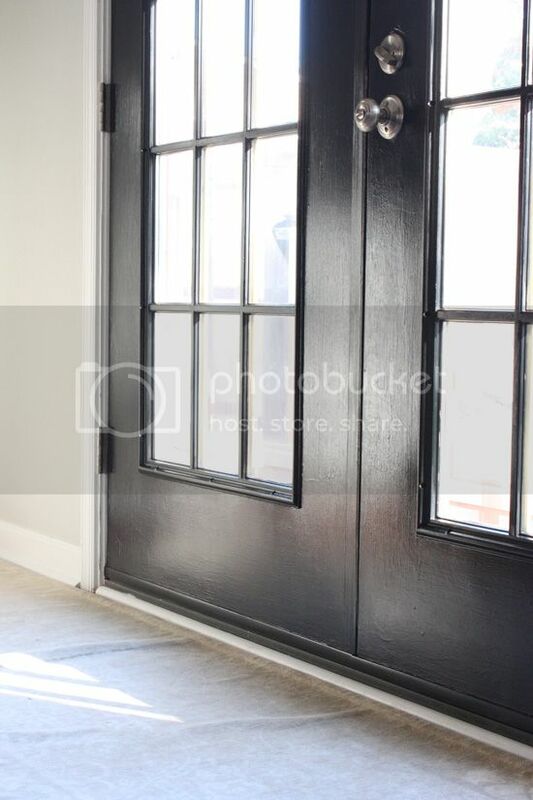 I honestly wasn't even thinking black doors to begin with, just wanted white and bright. Yikes, right? Yellowed, cracking plastic and a very hastily done red paint job. Definitely not the fresh clean look I had been dreaming about. I've been giving dirty looks to this side of the doors since we moved in almost two and a half years ago. Now before you get excited about a dramatic before and after of the red doors, I have to admit I haven't tackled this side of the doors - yet! They are going to need a little more TLC before I can paint and since the weather has turned chilly we don't really see them as much. I wanted to tackle the inside first since that's the side we see all day long. But they will be done soon and you will definitely see after photos. 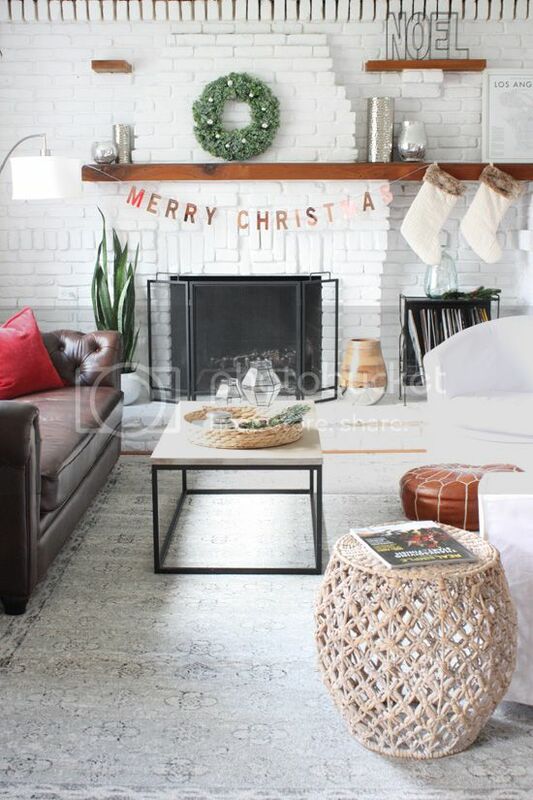 A few weeks ago I stumbled up this photo on Pinterest, and immediately my mind was made up. Keeping the dividers and going black on the doors. I didn't so much ask Jordan for his opinion, but just warned him that he just may come home one day to black doors. He was down. I'm lucky that there isn't much he doesn't trust me with when it comes to the house, and our tastes and pretty similar for the most part. 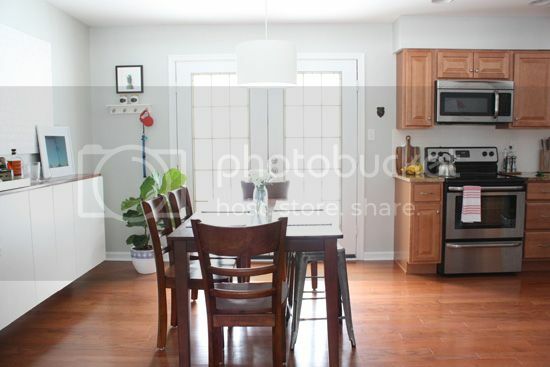 So while the doors don't look bad on this side, I feel like they didn't do anything for the kitchen. A lot of the kitchen has changed since this photo, most noticeably the cabinet colors (more on that before and after in another post). 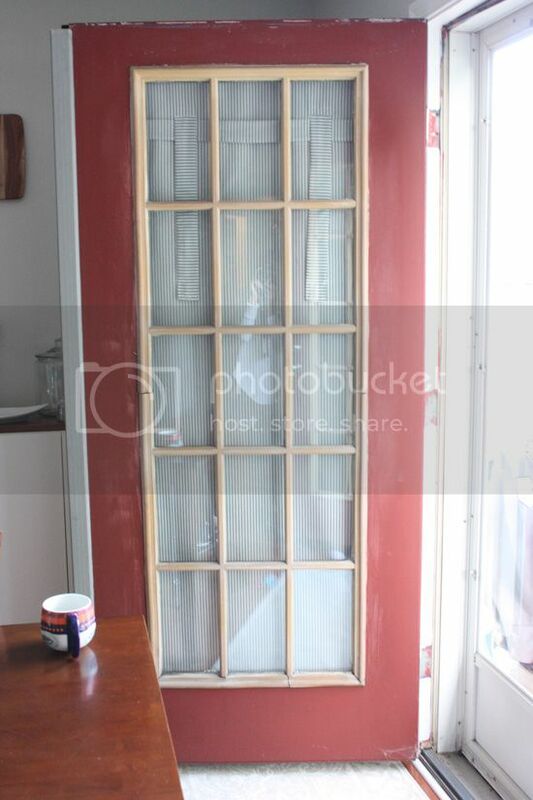 What you don't notice at first from the before photos was just how bad the hinges were. 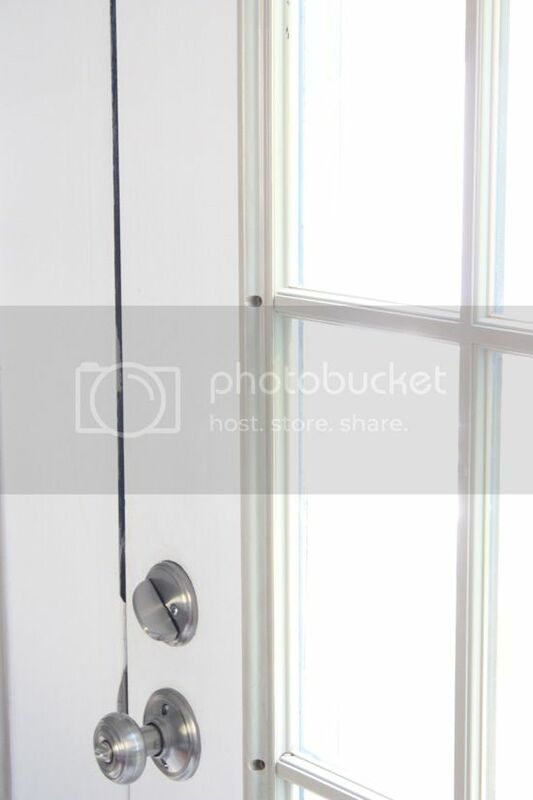 We replaced the door handles and deadbolts on all doors as soon as we moved in for both aesthetic and safety purposes since the house was a rental property and we didn't know how many keys were floating around. We also bought new hinges but never got around to changing them. 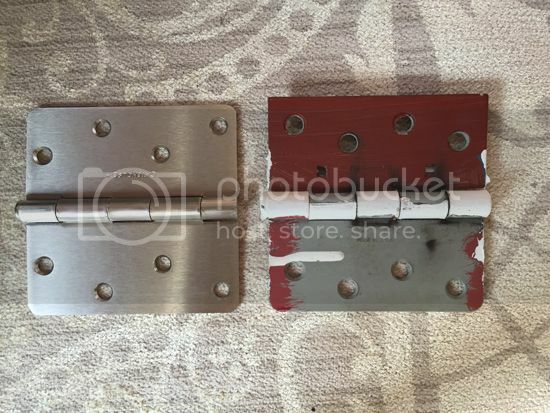 Once I started painting I was glad we had that hardware already on hand because leaving the paint covered old hinges was not going to work. Once of my biggest frustrations when moving into a house is when you being to discover all the little shortcuts previous homeowners took that you now need to fix. 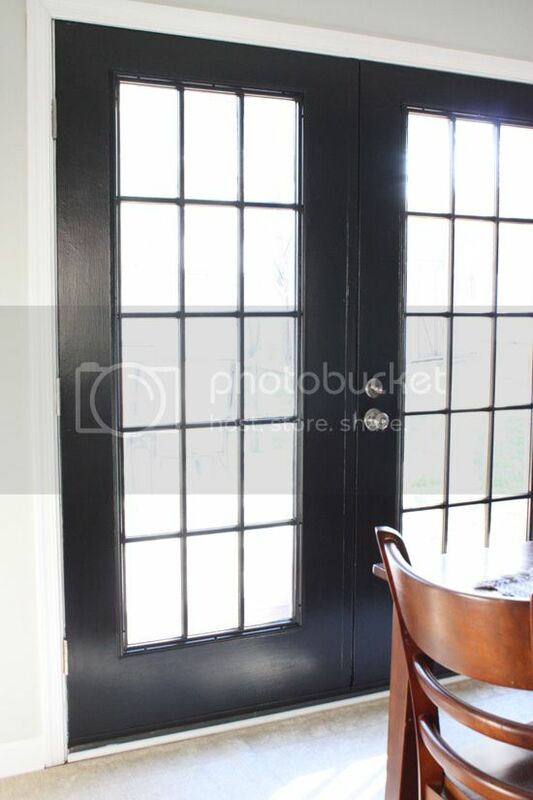 After a few days (let's face it projects take a bit longer when you have kids), we had fresh beautiful black french doors in our kitchen. It's been about two weeks and each time I look at them I think how much I really love the change. Not only do they look nice, but they make the kitchen FEEL different. 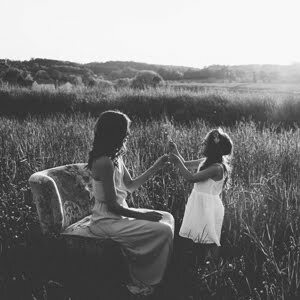 It's so important to me how a room FEELS because I'm spending so much time in our house as a work from home mom. If something doesn't feel cozy to me, it doesn't feel like home. The new hinges look so much better, too, right? 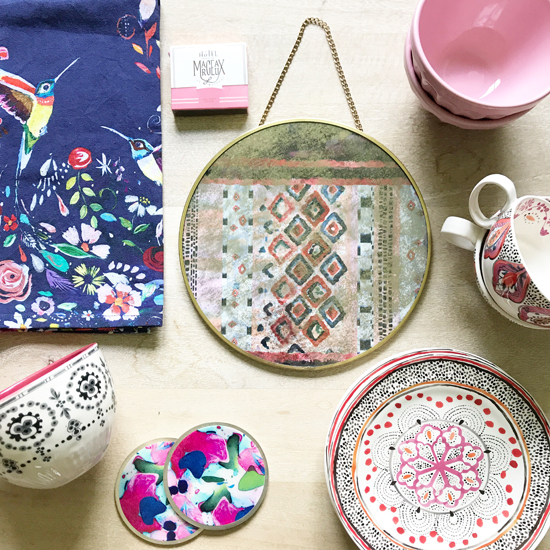 Purchasing a new kitchen table is going to be next on our list of things to tackle in the kitchen (and hopefully we will be doing so within a few months). This set is probably a decade old and we are slowly losing sturdy chairs and we've resorted to placemats to cover the condition of the top of the table. 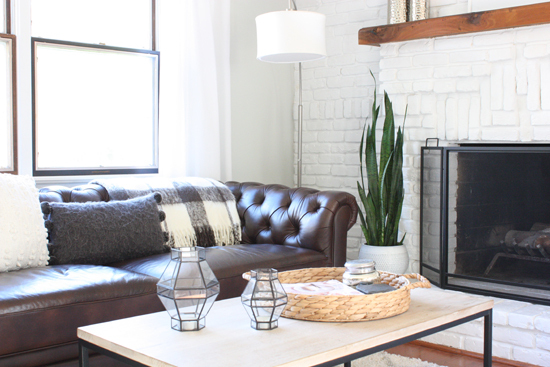 Since the table, floors, and top of our fauxdenza are all the same shade of wood, I am leaning towards a lighter, possibly gray toned wood. 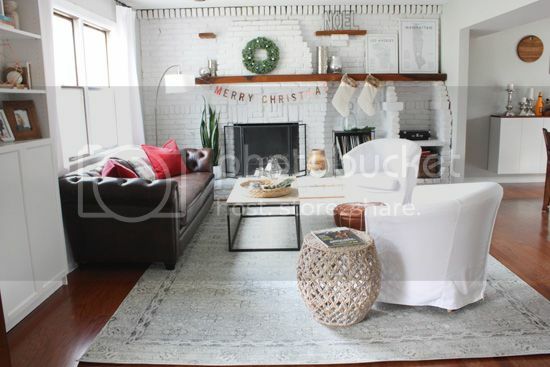 I love the look of this one from Target with a bench replacing the metal stools and some upholstered or metal white chairs on the other side. We also may hit up a local farmer's market and see what options they have. 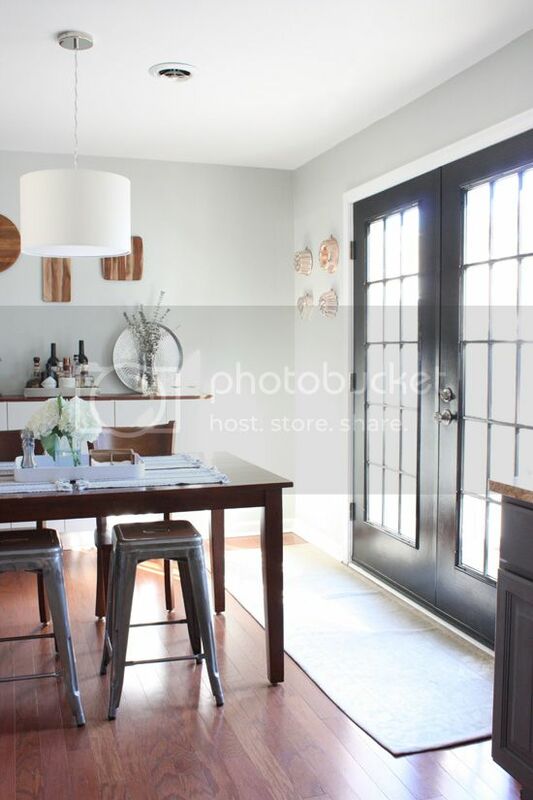 But until then, these pretty doors are a nice distraction from the old table, right? Since taking the after photos, I put the curtains back on the doors. 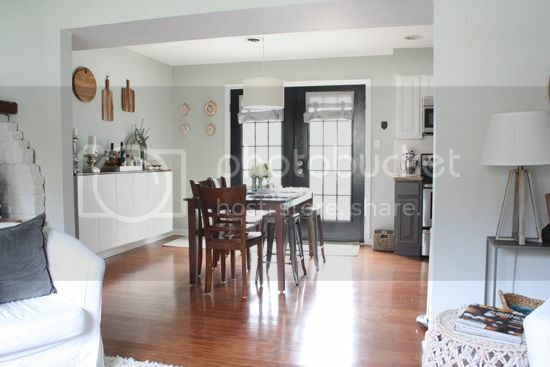 While I really love how they look without window treatments, the sun comes in so bright in the mornings that we can't even sit at the table to eat breakfast. 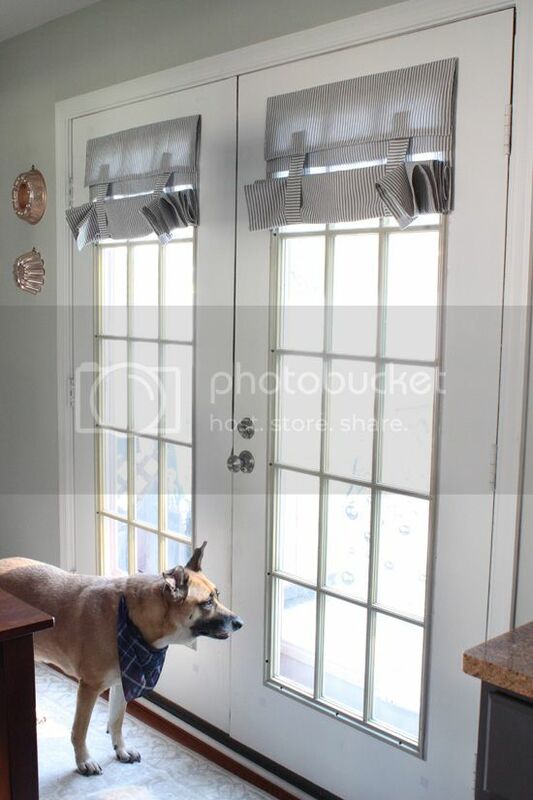 I searched for a while looking for window treatments that I liked and these are honestly the only ones I came upon that fit what I wanted, so back they went. They don't look bad at all, although I'm considering swapping the grey and white stripes for a solid black pair to blend more into the door. Anyone out there? Ok, I've been MIA from here for quite a bit, but the projects at home have not stopped. 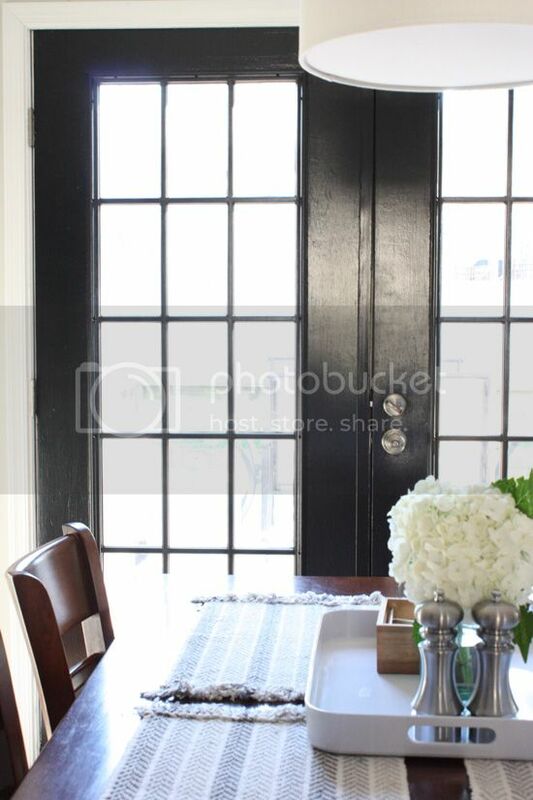 I have a lot to share with you including a recent project repainting our french doors in the kitchen. I also completely transformed our utility room into an office/craft room/mudroom after we converted our heat to gas and removed the oil tank. Over a year ago I painted our kitchen cabinets and just realized I never shared photos! I'm hoping to do some catch up and share some fun projects with you all again. 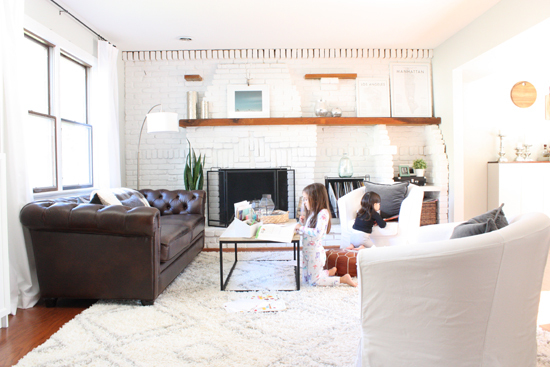 The house is clean and the girls are playing nicely together in the other room so I found this the perfect opportunity to snap some photos of our living room space to share how it currently looks. 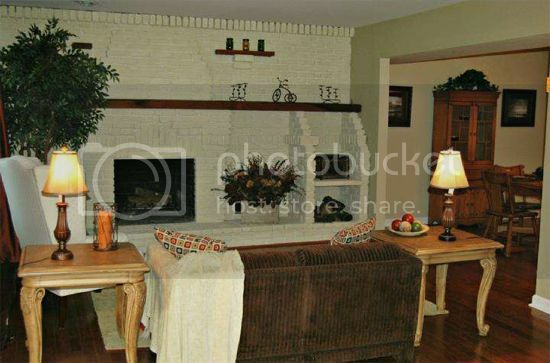 My biggest struggle in here has always been styling the fireplace. 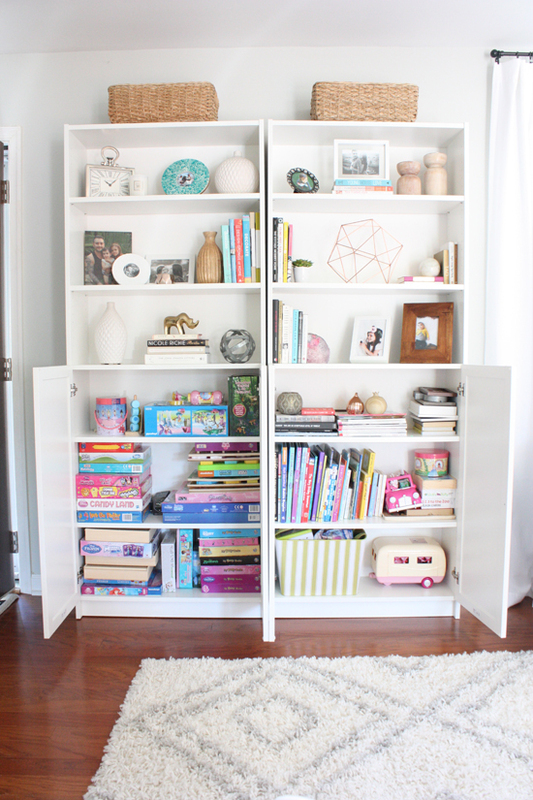 With all the shelves and nooks it can be overwhelming and cluttered. I'm not 100% satisfied but I am pretty pleased with how it currently looks. Clearly I'm a fan of vases... It's probably too much, but I've tried mixing up the finishes and they don't bother me. I'm sure next time you see photos this will look different anyway, it always does. This is definitely my favorite room in the house. I cannot wait to start snuggling up to some fires this winter. I recently bought that plaid fleece blanket from Target and it has been used a LOT already. It's so soft and warm. The light that we get in this room from both the windows and french doors is so pretty. These photos don't even do it justice. 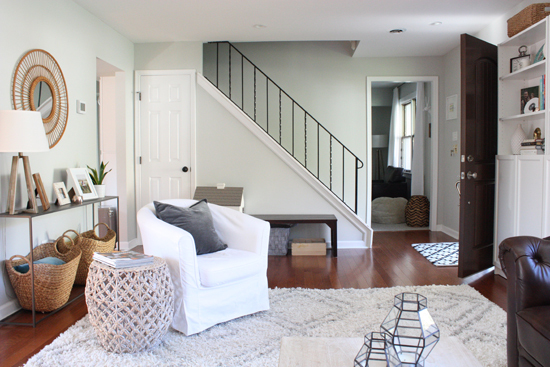 Here is the view towards the front door and stairs. 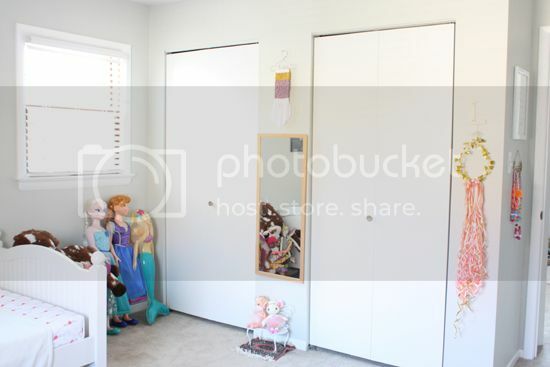 The white closet door is where we hide all the toys you can't see. It's actually a pretty deep closet and stores a lot since it extends under the slant of the steps. This table from CB2 is still one of my favorite additions to the room. 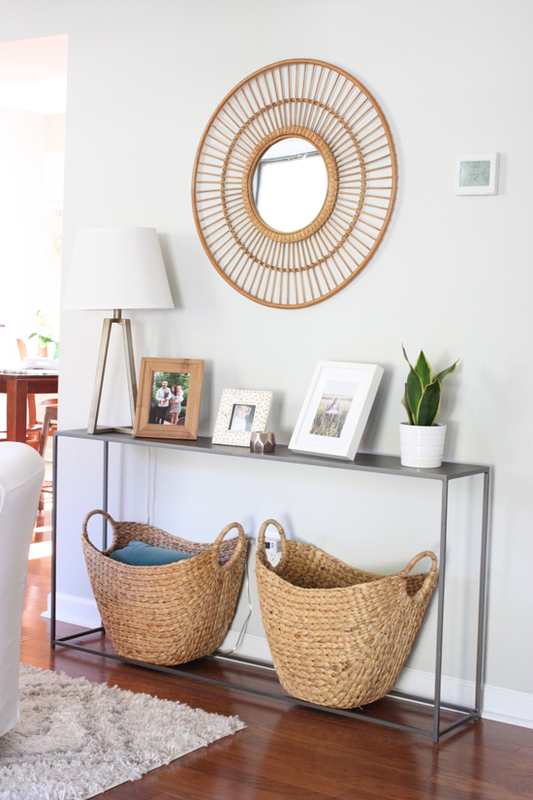 I bought the wicker mirror a few months ago from Target. I was on the fence about it at first, but now I love it. The rectangle mirror we had before just didn't fit the space right. The roundness of this one fills the space perfectly. 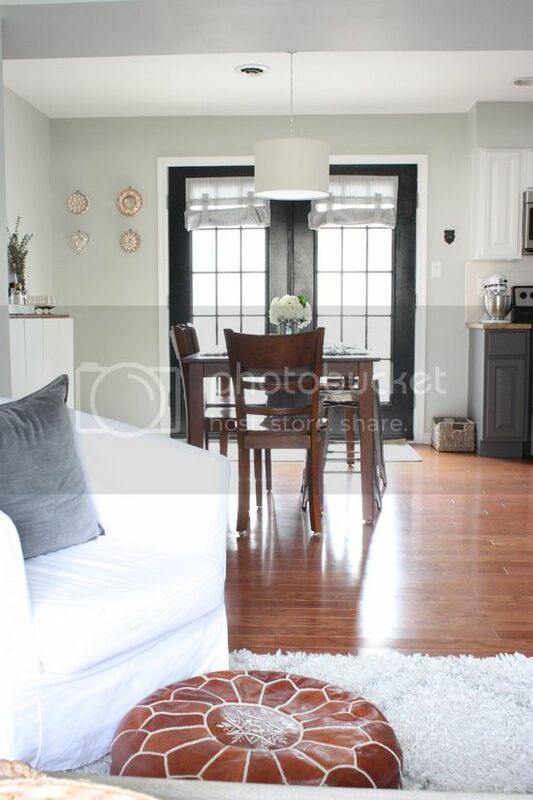 The only thing planned next for this room is painting the window frames (currently brown wood) a black color (similar to this) to mirror the french doors. If you look closely in these photos you'll see the bottom right window has already been done as a test. This is the most commonly used space in the house. The girls usually set up camp with their toys or coloring books. They play while I cook, clean or even do some work at the kitchen table. 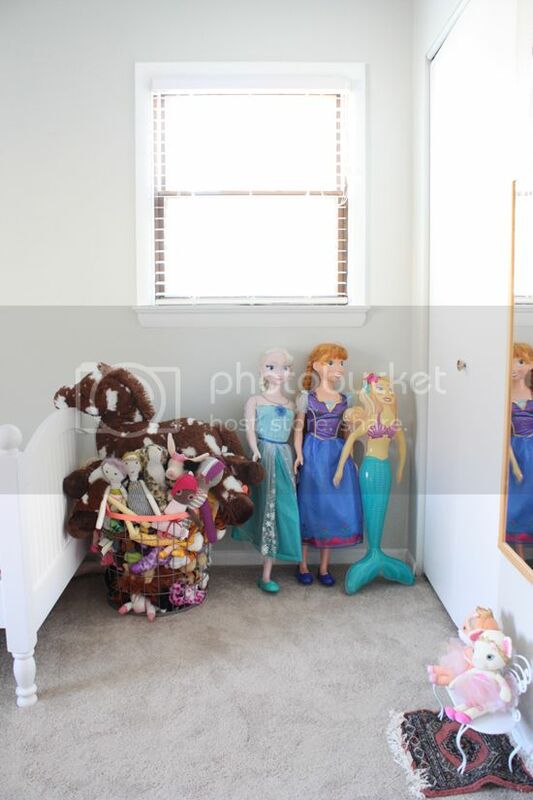 The chairs are usually pulled out and Barbies are usually scattered all over the rug (with Barbie shoes IN the rug). You can't see but the coffee table is covered in water spots and crayon scribbles. It used to bother me, but that's just how it goes with kids. 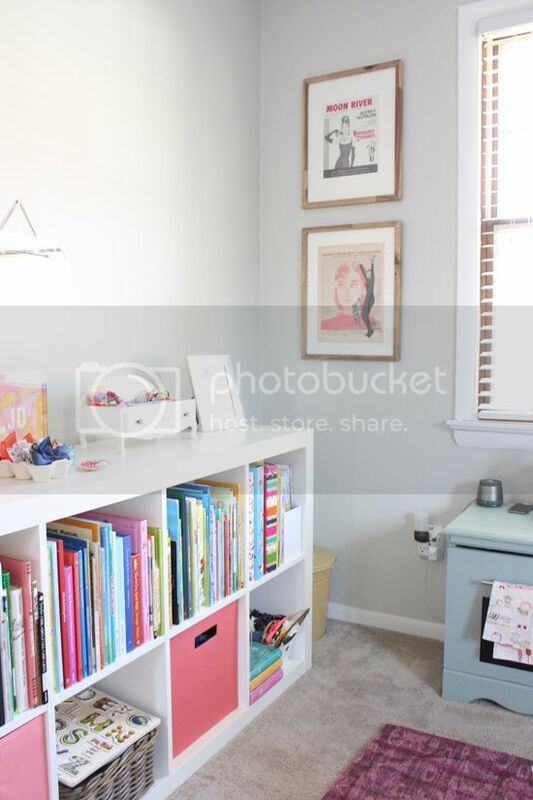 The bookshelves serve as storage for board games, books and puzzles. 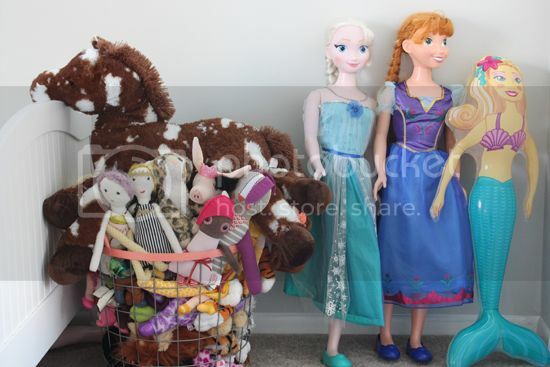 The rest of the toys are hidden away in the toy closet. 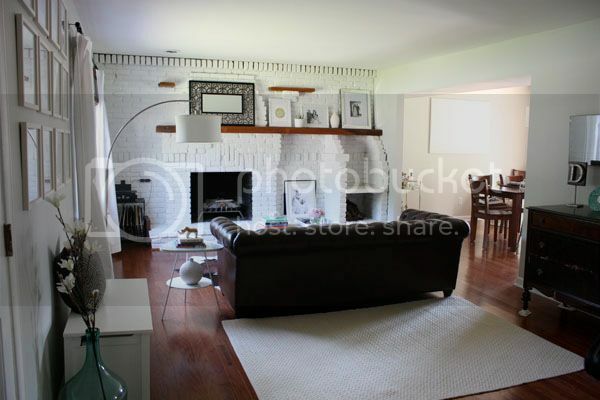 We have baskets tucked in the fireplace and under the bench that hold art supplies, blocks, and other small toys. The bookshelves are from Ikea and we mounted them to the wall for safety. I love that the girls can access their own toys in there. Between the bookshelves and closet they know where everything belongs and cleanup is usually pretty quick at the end of the day. There you have it. 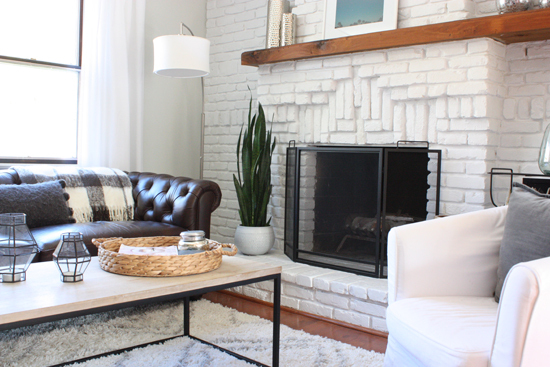 Our cozy, family friendly living room. 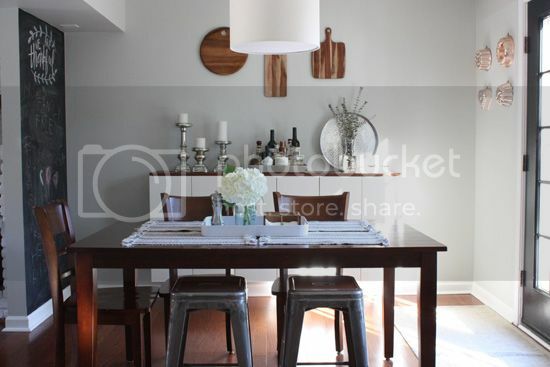 wall paint - Benjamin Moore "Moonshine"